Toy drives give members of the community the chance to have fun and donate toys so that underprivileged kids can receive new gifts during the holidays. ‘Tis the season not only to be jolly, but also to be generous and promote good will towards others. This year, throughout the holiday season, the greater Tampa area has a variety of different opportunities that allow us to make a difference in children’s lives in the form of holiday toy drives. Supportive Therapy Empowering People, a children and family counseling service, kicked off its First Annual Toy Drive back in October. “The children we are providing gifts for range from 4-17. We hope to make a difference in the lives of these children by putting a smile on their face,” said Reginald Vilmenay, owner of Supportive Therapy Empowering People. There are several locations where people can drop off their toy donations, including A Millenium Barbershop in Riverview, A Creative World in Apollo Beach as well as Supportive Therapy Empowering People and the Brandon Regional Hospital in the Woman’s Wing. Toy donations will be collected through Thursday, December 15. For more information, visit www.supportivetherapy.net. Bill and Sherri Brown will be holding hosting the 18th Annual Cookson Hills Toy Run on Sunday, December 4. The event starts at Veterans Memorial Park at 10:30 a.m. with an auction and raffle with the 20 mile “country” ride kicking off at 1 p.m. Once all riders reach the end of the country ride, there are trophies awarded to best decorated vehicles (one winner per category) and then a gift unwrapping ceremony. “These children come from a variety of backgrounds but one thing they have in common is that their provider’s income is limited, they don’t receive any government help or very little and there just isn’t anything left after necessities,” said Sherri. “Without donators, they would have nothing for the holidays. We aren’t set up to provide financial support to the families, but with help we can give their children happy holiday memories and to the parents a day of peace and happiness without stress.” For more information, visit www.cooksontoyrun.com. Thornton Chiropractic is holding the Fourth Annual Toy and Poker Run on Saturday, December 10, with on-site registration starting at 9 a.m. The registration fee is $10 and a new, unwrapped toy per rider/passenger or $20 per rider/passenger without a toy. The registration fee includes a T-shirt, food and beverages at card stops and one free poker hand. Participants are to leave the Thornton Chiropractic parking lot at 11 a.m. and arrive at the Brandon Harley Davidson at 2 p.m. “We had managed toy drives in office for several years and, in 2008, decided to step it up a notch,” said Jennifer Davis-Evans, office manager. 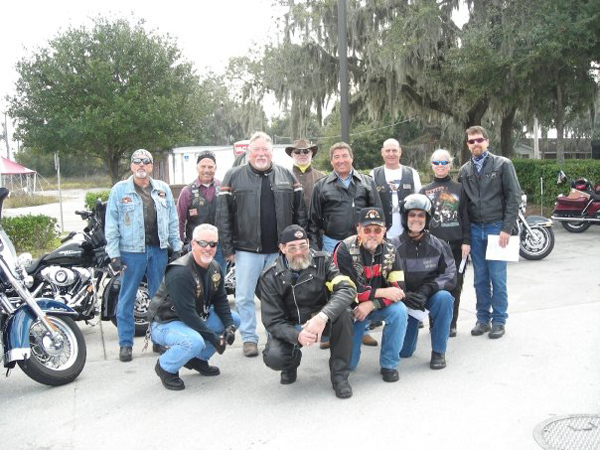 “All of us here are motorcycle enthusiasts so it was a natural choice to build out toy drive into a toy ride that included some Christmas Spirited two wheeling men and women.” The toys collected during the Toy and Poker Run will be donated to Toys for Tots and Guardian ad Litem. For more information, visit www.chiropracticdoctorbrandon.com. The Rough Riders of Tampa Bay will be kicking off their annual Teddy Bear Roundup on Saturday, November 26. Anyone interested in donating a new, unwrapped teddy bear can take them to the Westfield Brandon Mall and Florida Totalcom through Wednesday, December 21. The Rough Rider’s then dress in their uniforms and will deliver the donated teddy bears to children in area hospitals. For more information, visit www.tampa-roughriders.org.